A few extra photos have been added to the slideshow on the Home page. These are of the upper lounge area, the main bedroom's en-suite and a photo showing the other houses in our part of Mega and one showing the terraces and the 2nd ruin. The 2nd ruin has no roof but has four good walls. 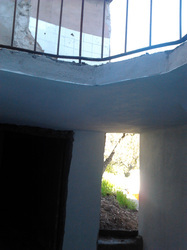 It would make an excellent studio and has a great view of the river beach and the valley. As we now have the property on the market for sale, it was lacking a number of photos of the house itself. This has now been corrected along with a general tidy-up of some menu options. The website is attracting a large number of visits, which is encouraging, so it was important to make sure the content supported the target - which is to find a buyer. Previously, the website was just a history of what we had achieved over a few years, like a diary, but it now has to have a different focus. 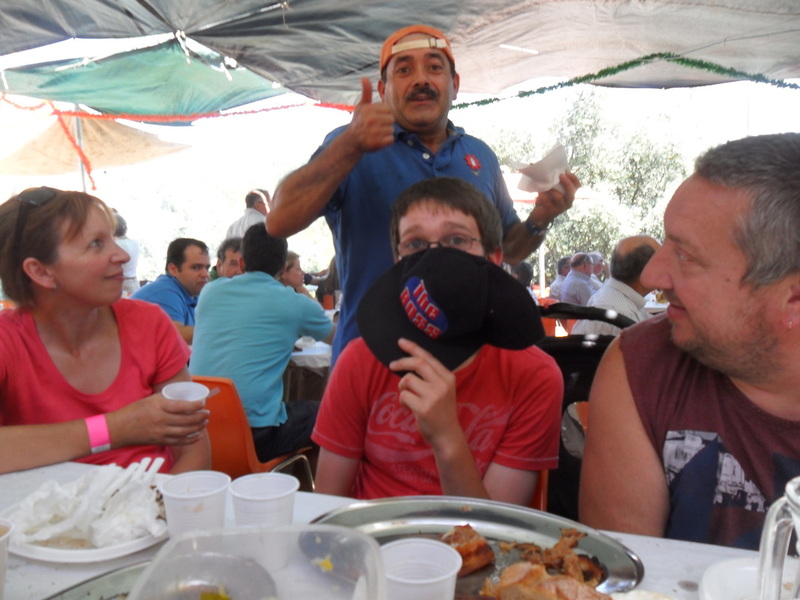 We have made some great friends in Mega Fundeira since we first started going there. 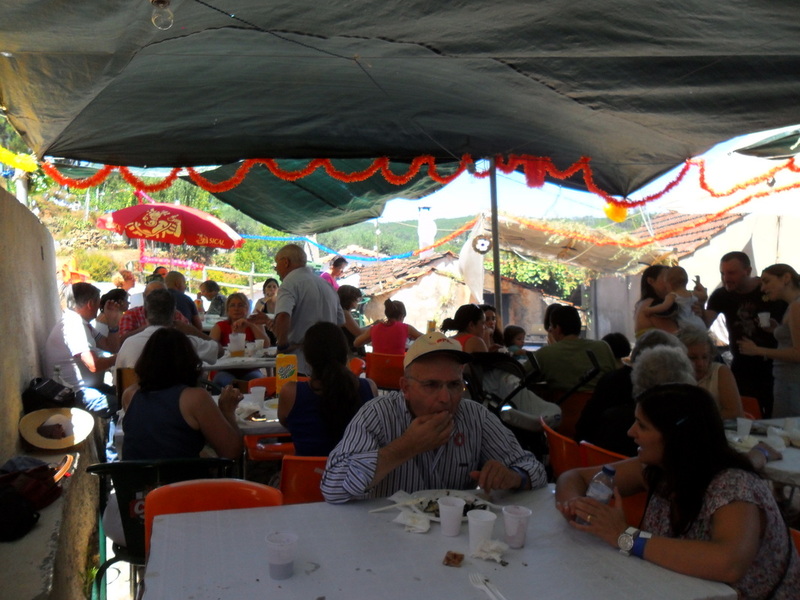 Although the hamlet is small, there are a number of activities run throughout the year. 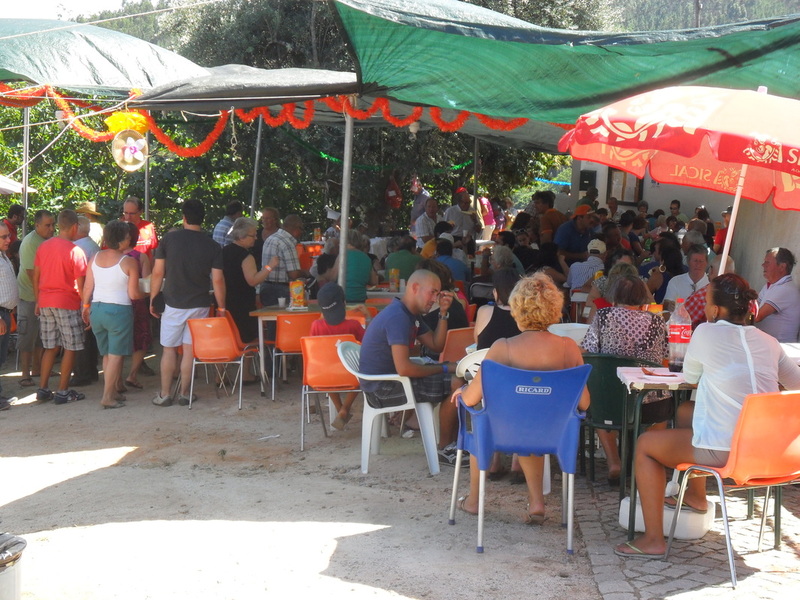 Some use the river beach area, where there is a cafe/bar during the summer months and a new BBQ area; and sometimes the functions are held at the new Community Centre in the larger part of Mega Fundeira. It all creates a wonderful, friendly community that it is an honour to be part of. 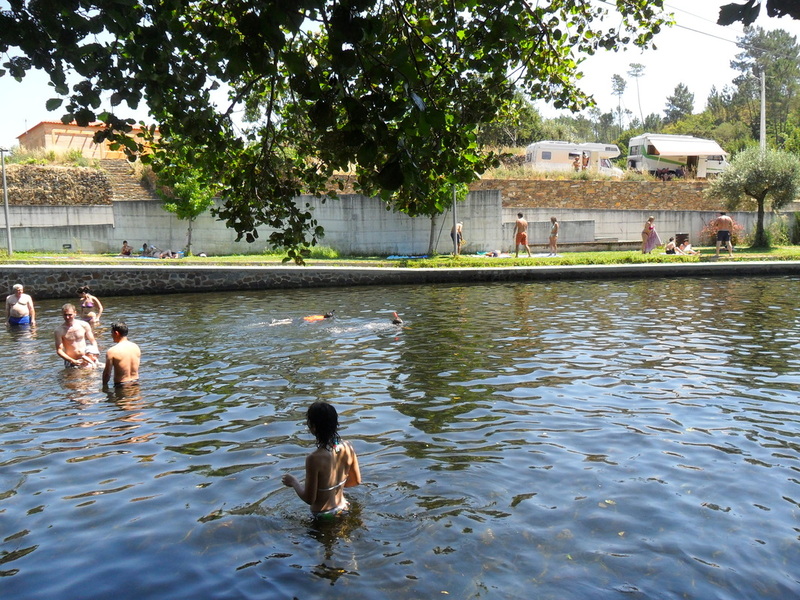 Understandably, we will continue our involvement with Mega Fundeira after we no longer have a property there. 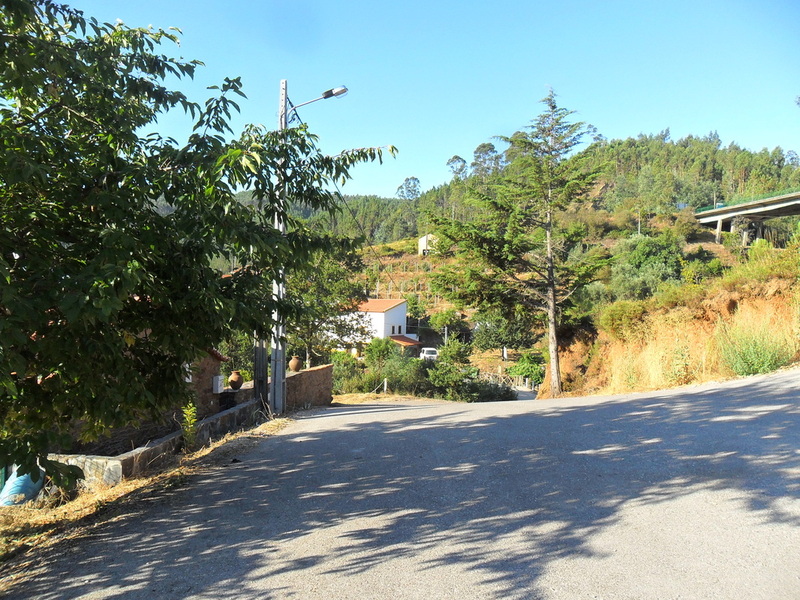 Since we moved to Portugal permanently in July 2015 and lived in Casa da Ribeira for a month until our new property in Casal da Azenha was ready, we have continued to visit Mega Fundeira quite often. It is always a delight to go there to see our friends, the river beach and our property. The property is being sold now and we have had a number of viewings, always favourable but not, as yet, had an acceptable offer. 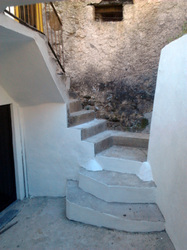 We did reduce the price recently from €120,000 to €99,950 in an attempt to attract more interest, and that has worked. On the property are two ruins. One is just a square shell but quite substantial and could be developed. 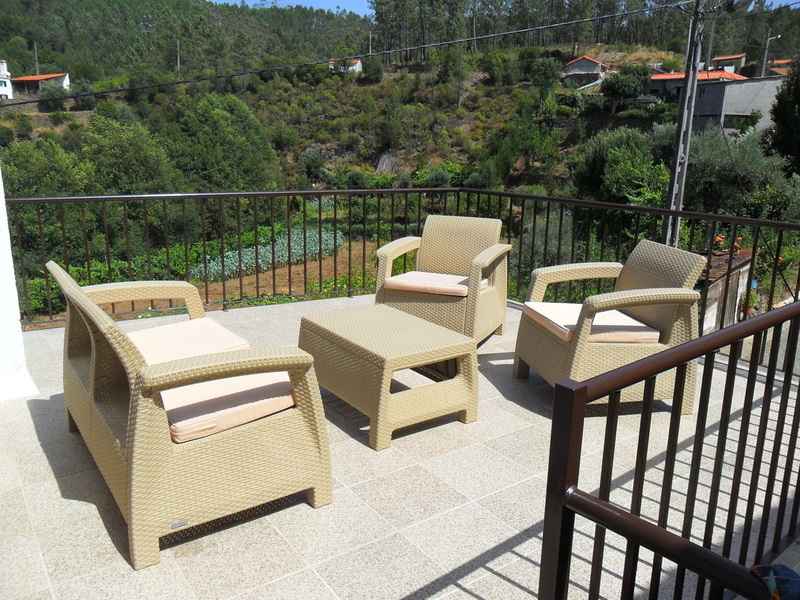 This sits on one of the terraces and has a great view over the valley. The other ruin is a two-storey schist house with two single-level buildings attached. 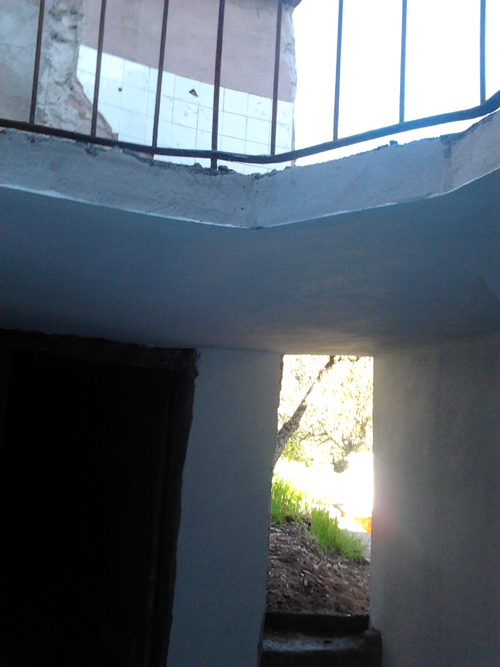 This is next to the main property and has great potential for development into living accommodation. 25th Dec 2013 - We decided to stay at the Ramada Encore Hotel at Luton Airport for Christmas Day. By doing this we would not have to leave home so very early. 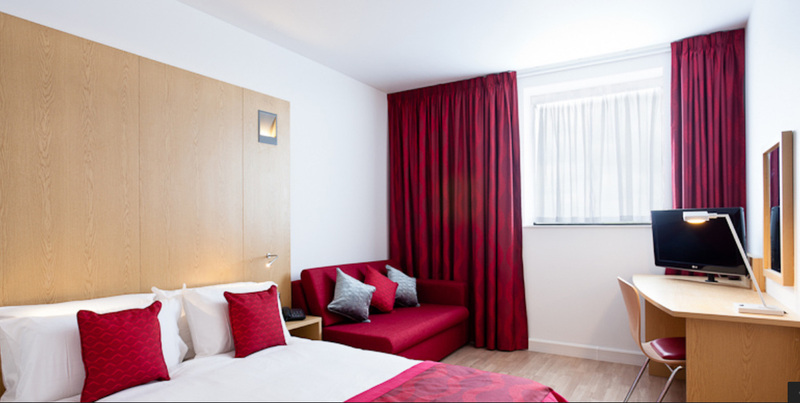 The hotel is a few minutes from the airport, walking distance in fact. Unfortunately, they only had very limited bar meals. Also, Roy had slipped over on the soggy, muddy grass outside and was caked in wet mud when we went in to sign the register. He hadn't brought a change of trousers with him so set about washing the mud off and then using the hair dryer. It nearly worked. Comfortable room as per photo. The flight to Lisbon took 2hrs 5mins and was uneventful. EasyJet is our airline by choice now. We had reserved a car with Europcar but they had none! Well, not for hours anyway. We got one eventually. The Lisbon route is much easier than getting through Porto; we were straight on to the main A1 and out of Lisbon in minutes. 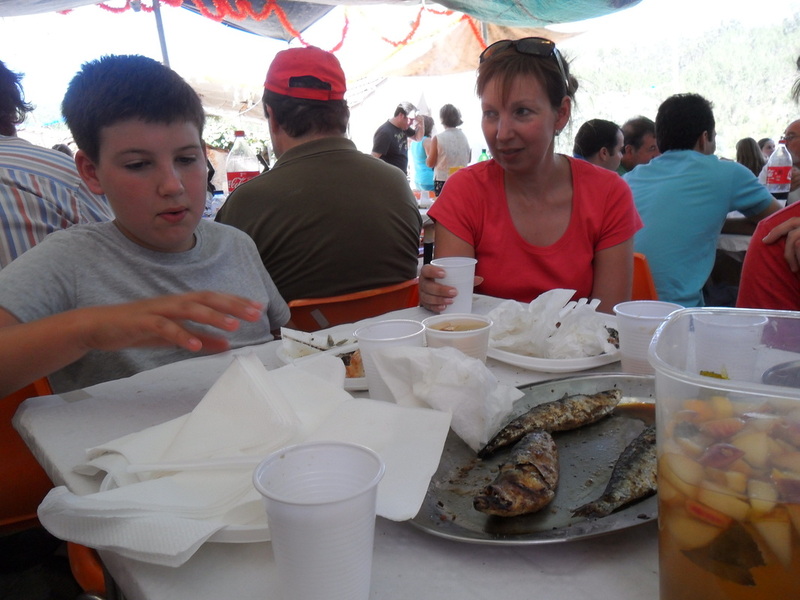 It was 4pm, 26th December when we got to Mega Fundeira after a shopping stop at the Intermarche in Pombal. Rosa-Maria was there to hand us our bunch of keys the builder had used to gain access in our absence. The corrective work he was asked to do he had done very well and we were pleased. But how do we pay him? We don't even know his name! We'll have to aks our Portuguese/Spanish friends who recommended him. The weather was pretty dismal, raining most of the way. And we had the same on Friday 27th Dec.
Not a very good photo taken to show the view from Cafe do Alto where we went for lunch on Friday. To us, this is the best cafe in Portugal. And for £6s each - a main course, wine, dessert and coffee. True. Apart from the price, the location, cleanliness, friendliness, food quality and choice were excellent, as always. Next to Pedrogao Grande to collect our other set of keys from the Esfera Real Estate office. Claudia, our solicitor, happened to be there so it was lovely to see her again, and Carlos, of course. We'll go back and see Fernando another day. 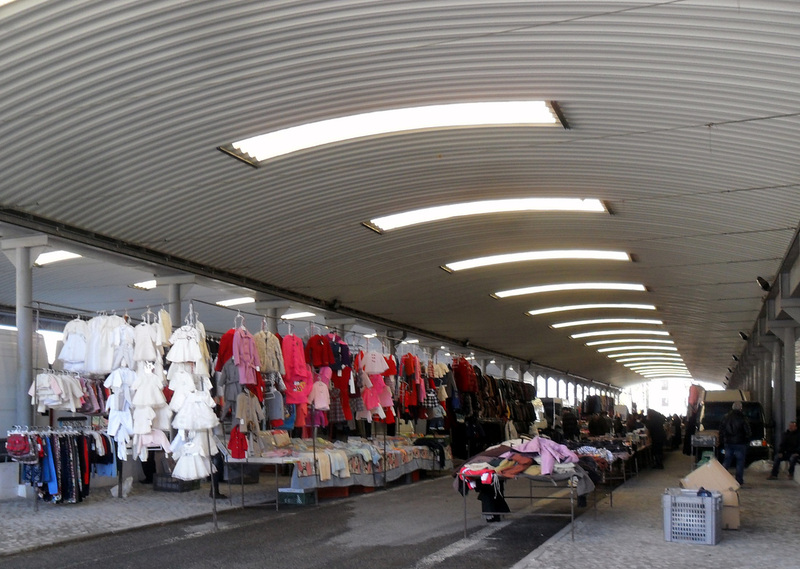 The photo shows just a small part of the undercover market at Figueiro dos Vinhos. Lots of clothes, shoes, household items, fruit and vegetables, meat, bread, plants, etc. All you could need at a low price. 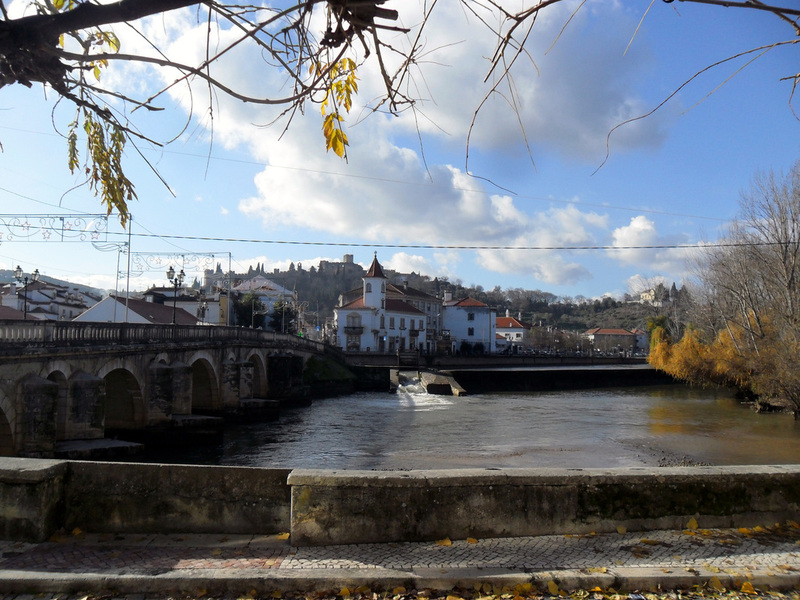 Next was a trip to Coimbra, Portugal's third largest city and a university town. It was still raining. We used the new A13 toll road. 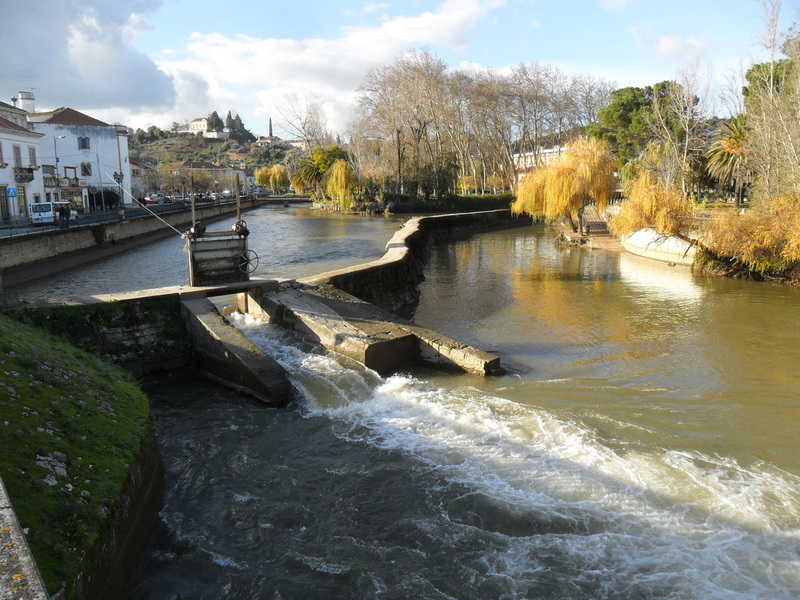 With our backs to the river Mondego, we took this photo showing a pedestrianised walkway through a part of the town where there are numerous cafes and tourist shops. It continued raining on our way back so our plans to stop off in Miranda do Corva and Lousa became just a drive-through. Sunday, 29th Dec. A very misty start to the day. 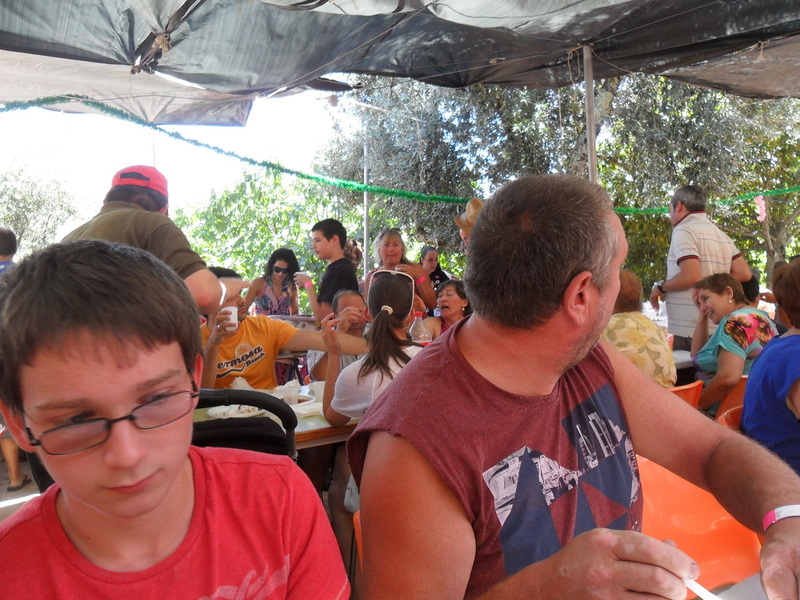 Went to see Sammy and Anna at their market in Campelos, just missed Trevor and Michelle. 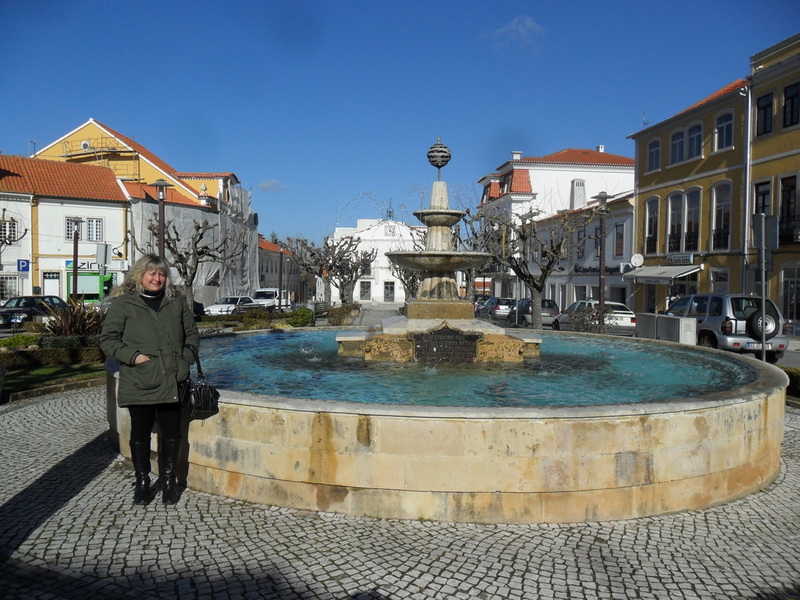 Then a short stop in Ferreira do Zezere, a lovely clean town with wide roads, before heading on to Tomar on the A13. 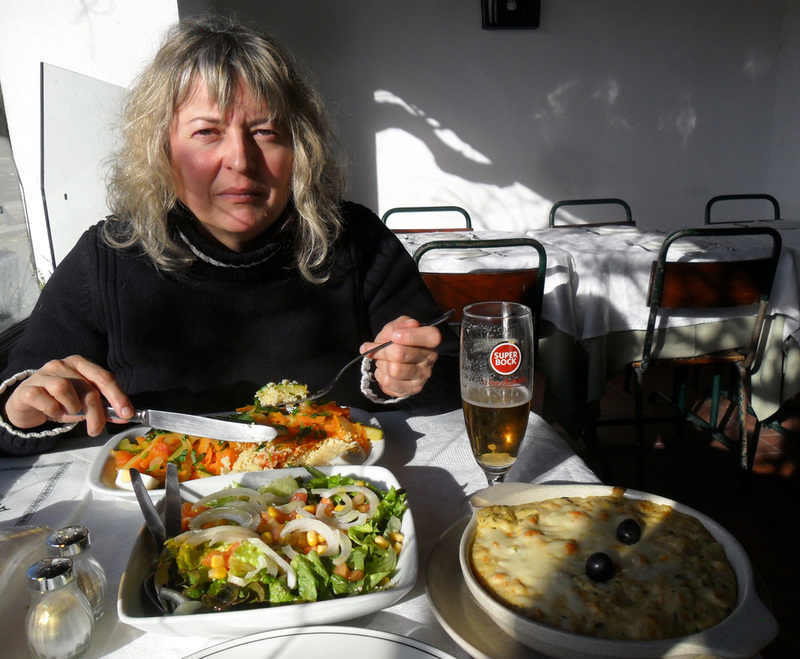 The Restaurante Bela Vista in Tomar did a vegetarian meal for Susan and I had the Bacalhau (cod, potatoes, melted cheese, etc) this was after a starter of fish, olives, bread, goat's cheese, beans and pork (that's all I can remember) plus a couple of beers. The meal came to 29 euros. An English couple sat on the table next to us. Fernando and Carlos in Esfera offices. Went to Cafe do Alto for lunch - great. Met Ankh, a Dutch artist. She exhibits at Sammy's Sunday market. Next we went to Pedrogao Grande to take this photo, mainly to show the two paintings that Susan did that were bought by Fernando (nearest). 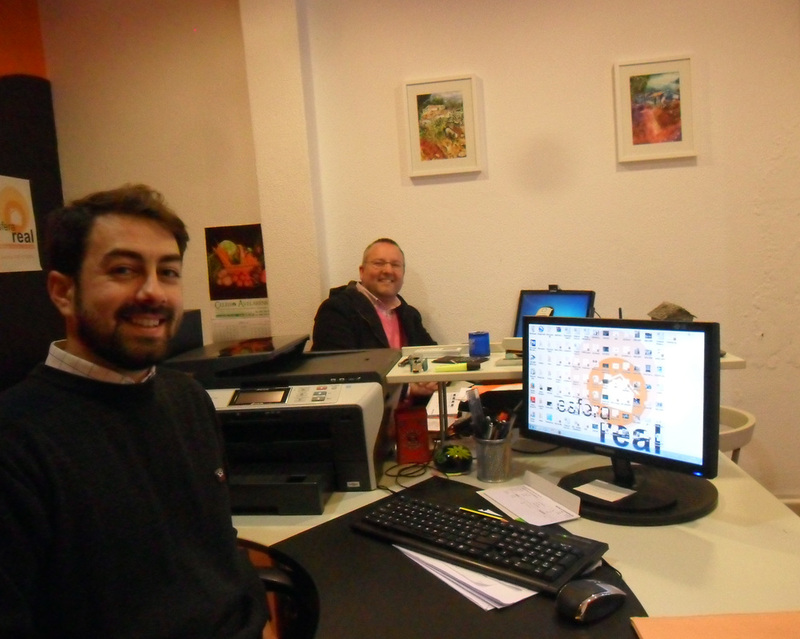 Here he is with Carlos in their offices - Esfera Real Estate. Susan wanted to try the cafe that has wi-fi so we went there and, yes, met an English woman and her daughter who are renting a friends property for a year to see if they want to make a permanent move to Portugal. 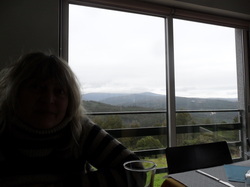 Decided not to do any long drives - just to Cafe do Alto for lunch. Tomane introduced us to Chris, and Englishman living nearby who originates from Norwich (40 mins from where we live in the UK). The postman called and left us our water bills - £5s a month. That's about £4.80 each month. Here in the UK we pay £48.00 each month. Coincidentaly that's 10 times as much! The wonders of social networking sites! We facedbooked our kind friend and neighbour Snr Fernando and Fatima to see if they would be in Mega between now and December and could check with Maria Rosa, our direct neighbour about the keys and if she would be at home on Boxing Day. As luck would have it someone was stayng at Snr Fernando's house and within a day we had a reply that they had spoken to Maria Rosa and yes she will be there on Boxng Day. As always we are indebted to our Portuguese friends. 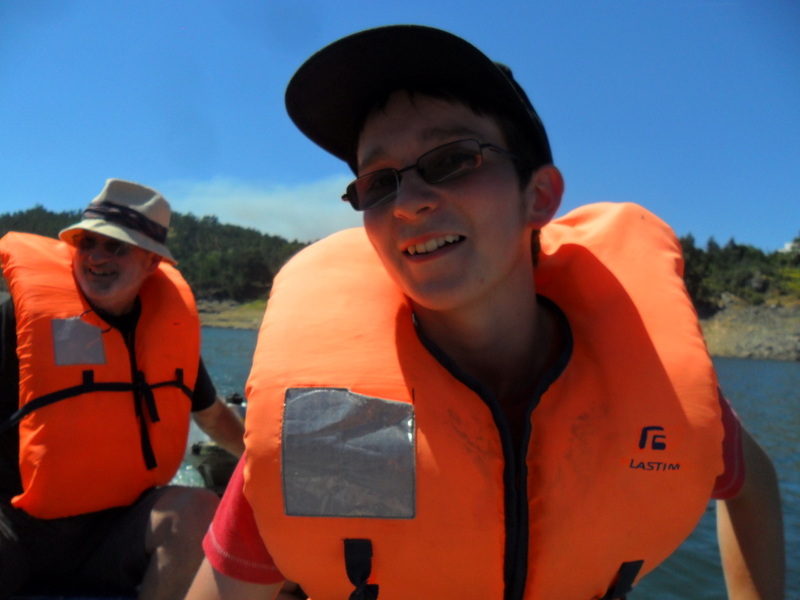 We are also very glad because without the keys we would have no access to our water supply, or to the garage for logs for the fire, or be able to turn on the gas supply. Phew, what a relief! I am also so glad that I had the foresight when we visited in July to do endless trips into the forest with my niece for pine cones to use as kindling. 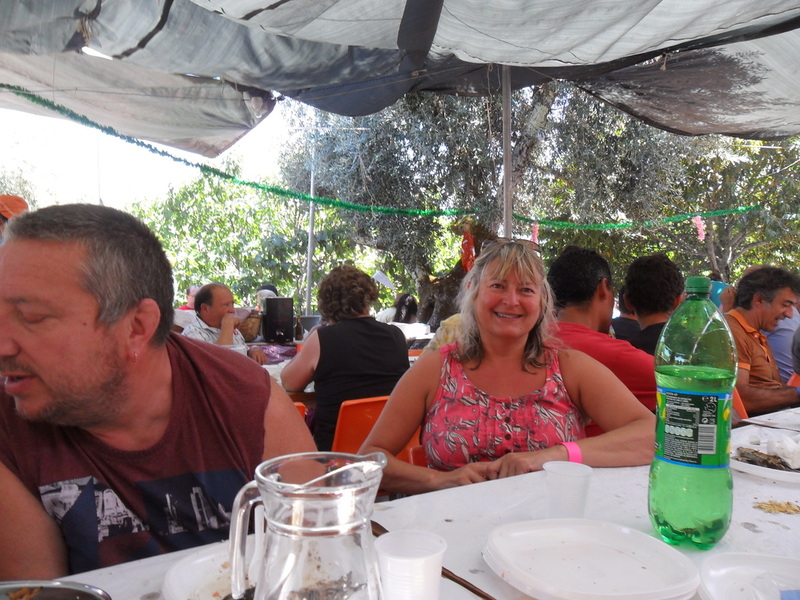 The only down side is that our dear friends Barry and Julie will be back in the UK for Christmas/New Year. 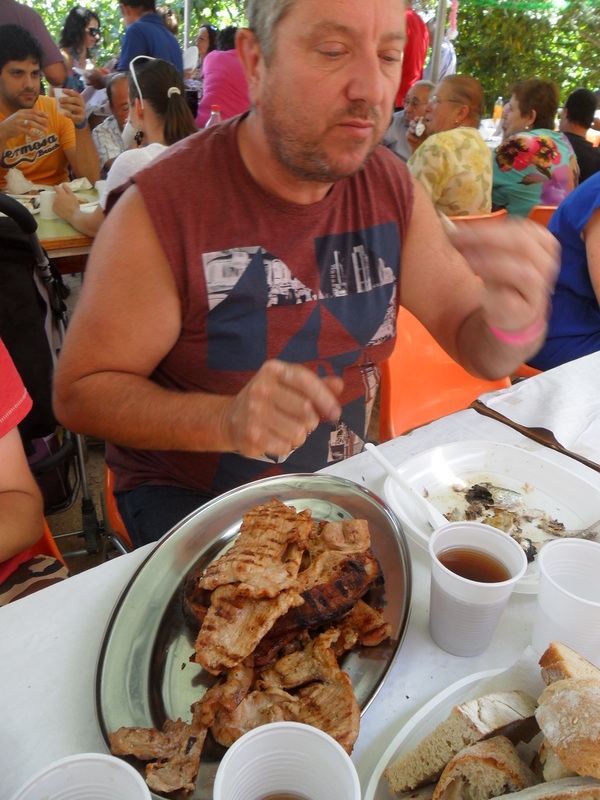 Looking forward to being back in Mega Fundeira. 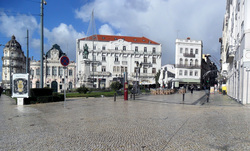 We fly out from Luton to Lisbon on 26th Dec and will spend 6 days in Portugal. Flying back early on the 1st Jan 2014. We are going there to check a couple of jobs a local builder has done. He was asked to put right some new plumbing connections that were wrongly installed when we had the last lot of work done. This work is the last that is needed on the house, apart from some minor jobs, so from now on we can just relax when we are there and enjoy Mega. We will miss the Chestnut Festival on the 17th Nov but we'll get to that another year. Our only real concern is whether our neighbour will be at home on the 26th as she has our keys. She kindly let the builder in to do the work. The keys are not only for the front door but also for the water and gas. We should have taken note of her phone number. 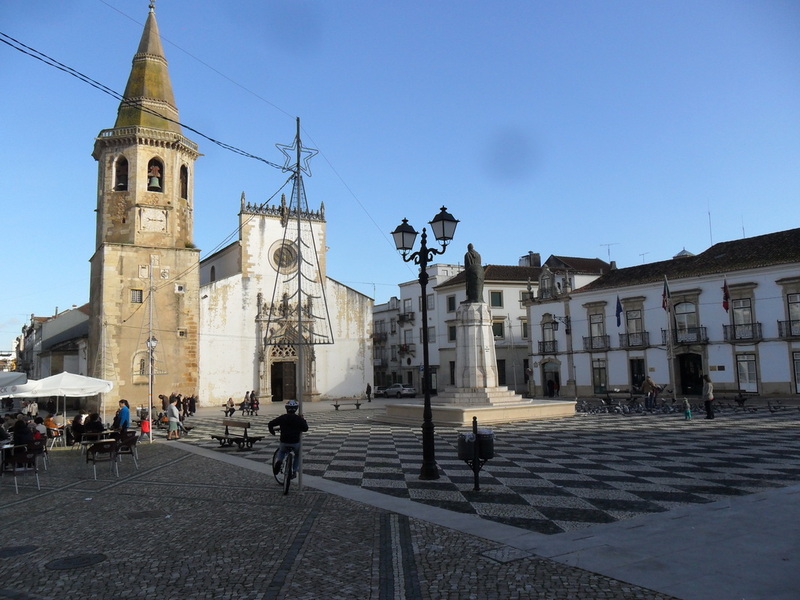 A visit to Coimbra is planned. 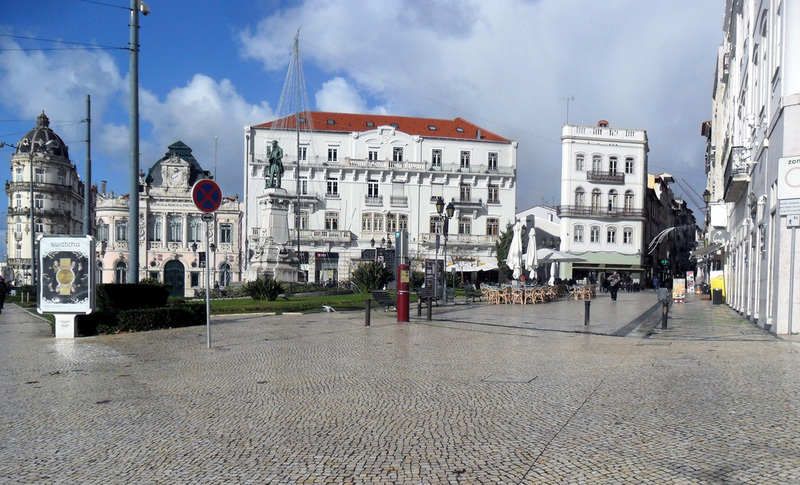 This is the third largest city in Portugal. And we want to see other major towns as we won't be sunbathing. The house and land are looking very good. 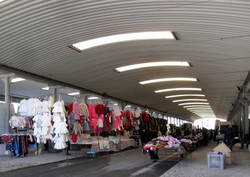 We now have a large gated parking area with a covered terrace and a BBQ. 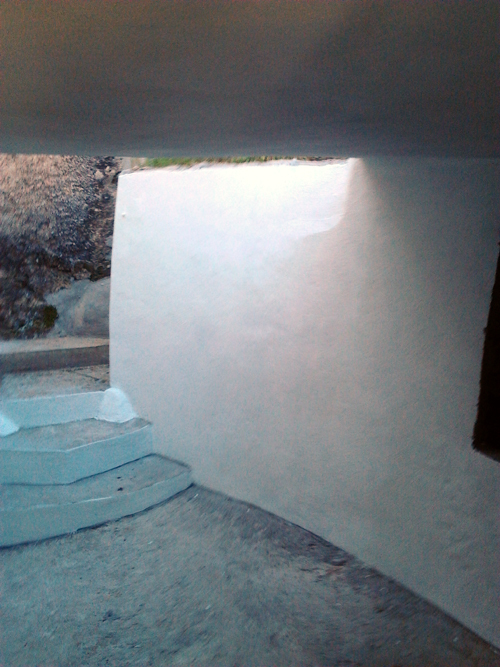 The land is looked after by Tiago who is doing a great job, always very tidy, it makes a huge difference. 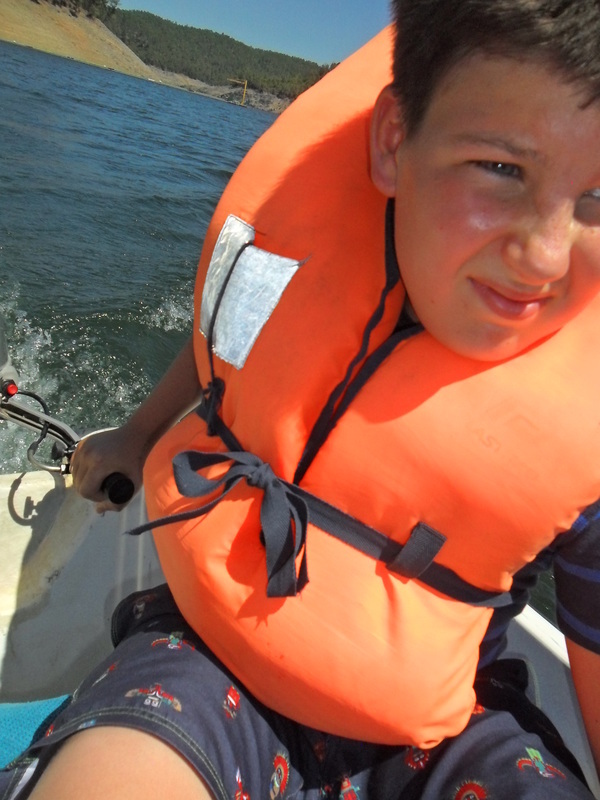 Seven of us descended on Mega Fundeira in a VW Transporter in sweltering heat. 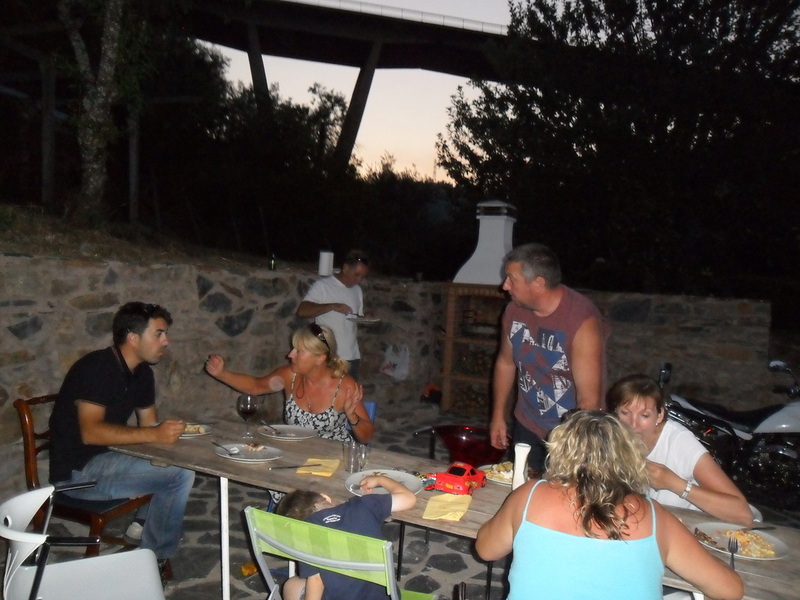 We bought provisions on the way in Figueiro dos Vinhos and off-loaded everyone at Casa da Ribeira. Our white bodies blinded the locals. 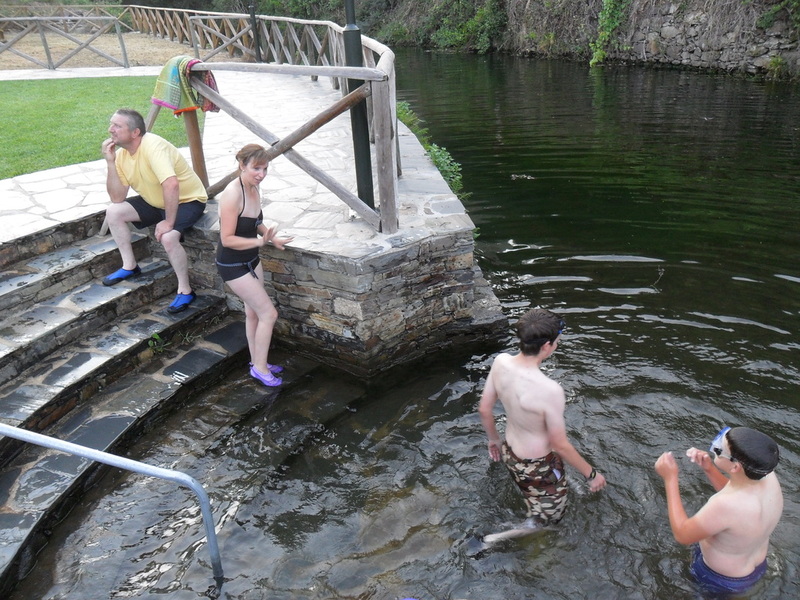 Hurn and Hayley had come prepared for the stony river bed as you can see by their water shoes. 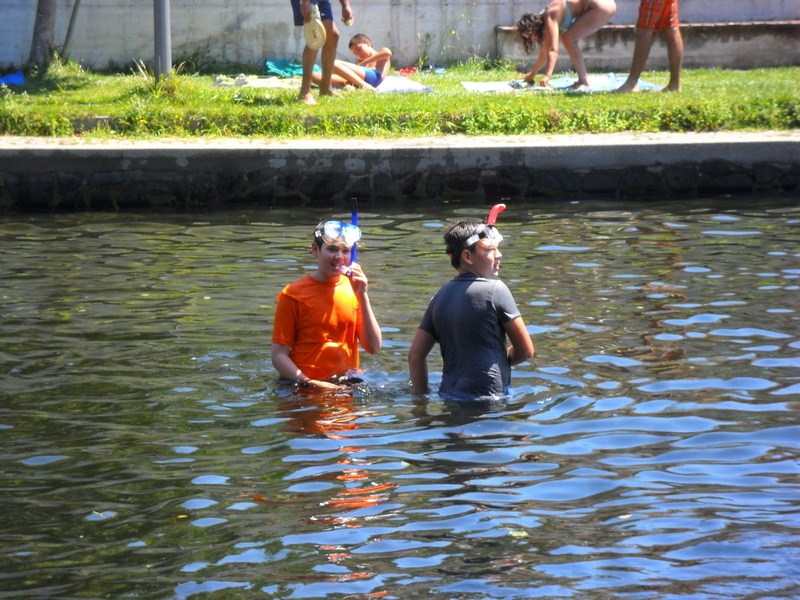 The boys, Jay, Thomas and Sam, had brought 5 snorkel masks with them and a couple of snorkels. 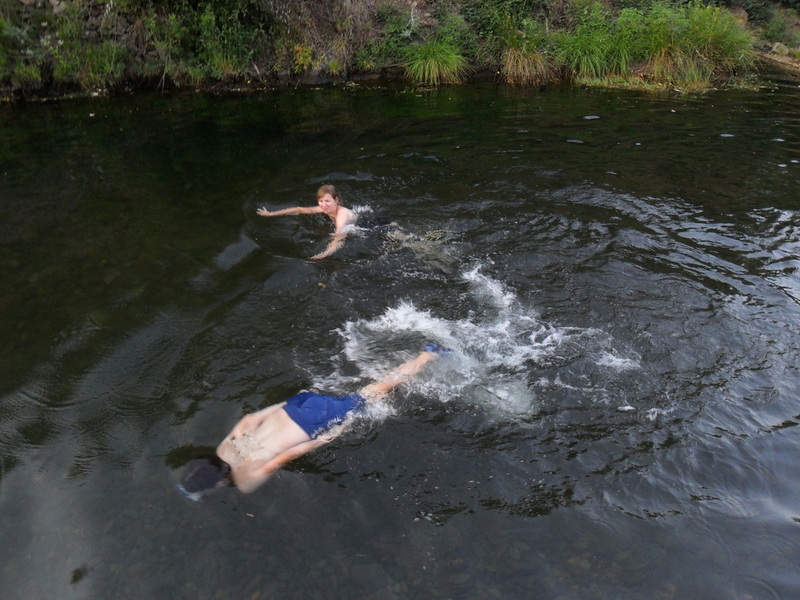 The clear water was an ideal spot to search the river bed for a rare fish. All clear in a few hours - amazing! 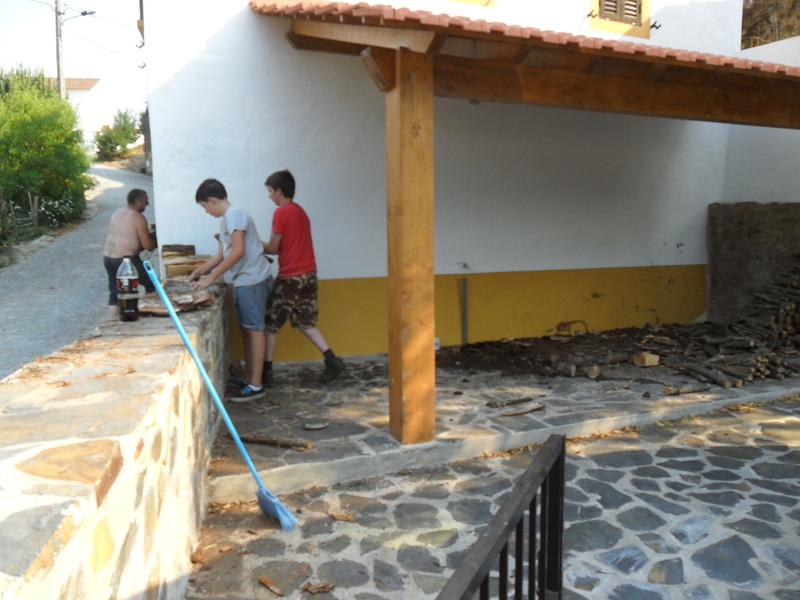 We needed to clear the logs from the terrace and it was a daunting task in the heat. But Hurn took it on and with some help from the boys, shifted all the wood into the garage. Wednesday - our first use of the BBQ. 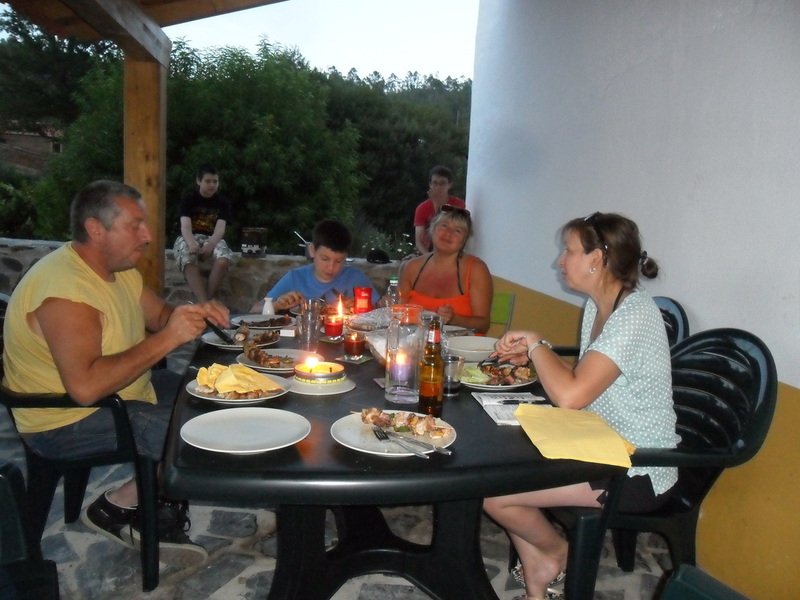 Hayley and Hurn cooked the meat while Fernando and Barry borrowed a table from the river beach. We took chairs from every room. We had no outside lights, not even candles, so the darkening night ended the party. 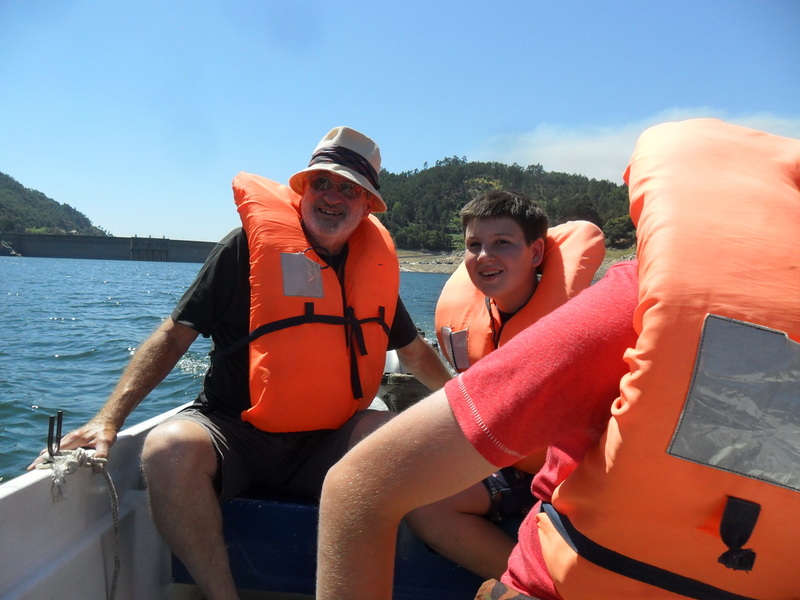 A ride to Mosteiro river beach for a change of scenery was enjoyed by all. Handy for ice creams, drinks and lunch. 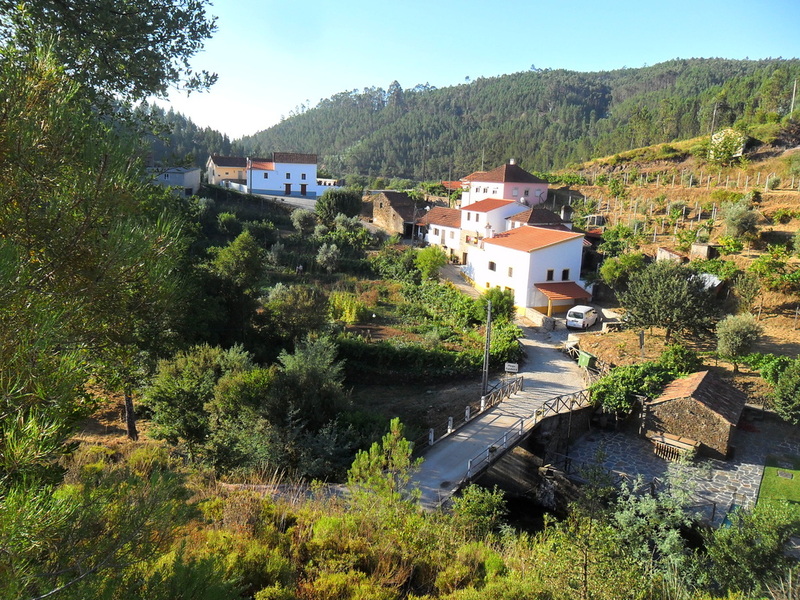 Mega Fundeira - a truly lovely, peaceful hamlet. We made good use of having a large vehicle and drove to Parc Montego retail park. With Hurn doing the packing, we managed to fit in a table, six chairs and a 4-seater and table set for the roof terrace (see below). 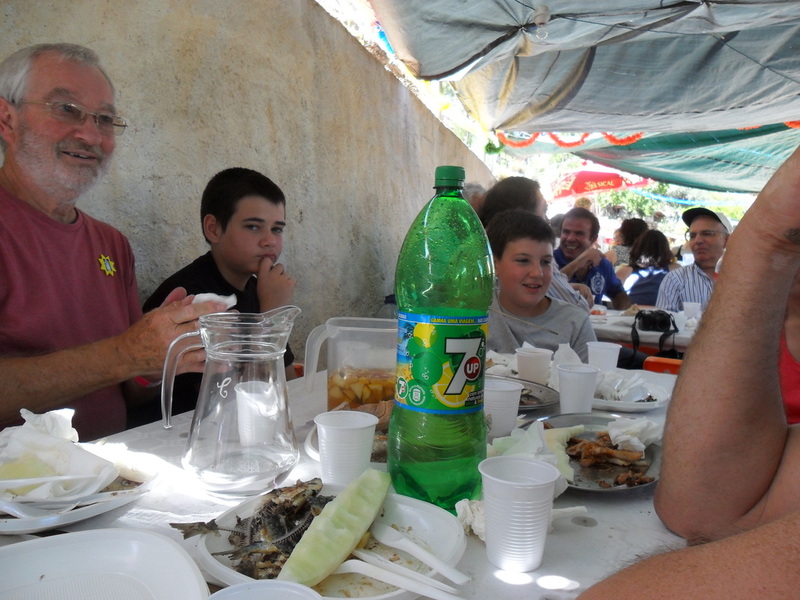 With the area cleared of logs, we were able to sit outside, shaded by the terrace roof, whenever we wanted. It did mean that we were greeting every passerby with either 'bom dia' or 'boa tarde' according to the time of day. Saturday 2pm - the Mega Summer Party by the chapel. Plenty to eat and drink all day. 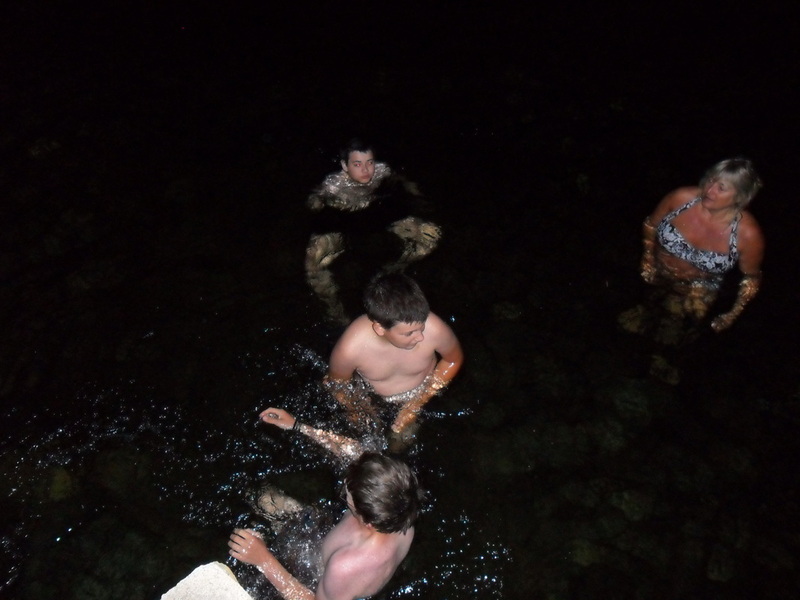 Taking a dip in the river beach in the late evening was great fun in the dark of night when it was unlit and with no-one else around. And they made good use of the opportunity. This was something that the boys will remember for a long time. The new furniture for the roof terrace really made a difference. It was too hot during the day to sit there but once the sun had gone down it was a fantastic place to relax and enjoy a glass of vino. 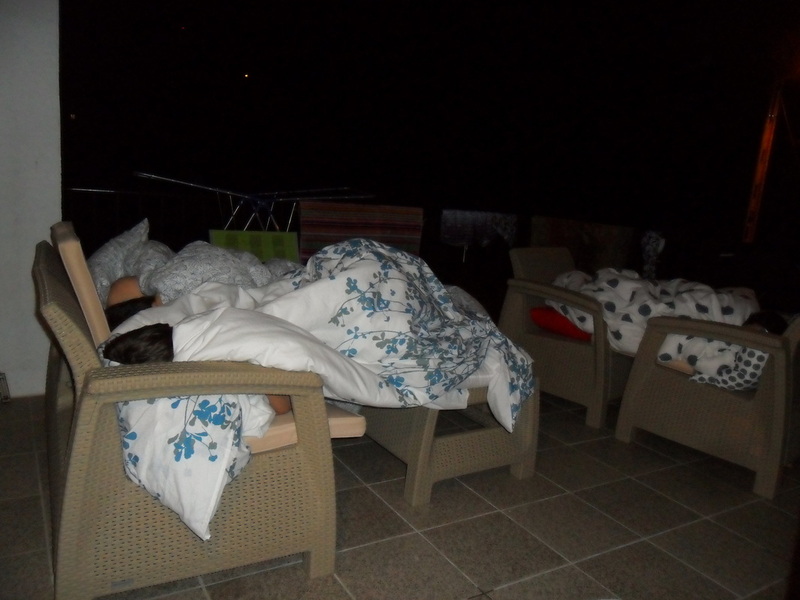 The boys thought that they would sleep under the stars one night. 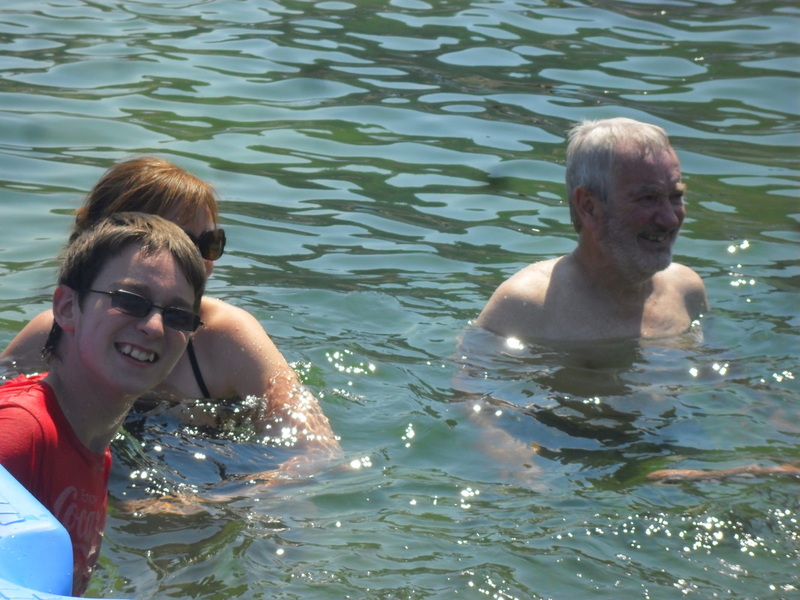 A visit to the Cabril Dam to hire a boat and have a swim in the special river pool. A forest fire in the distance. 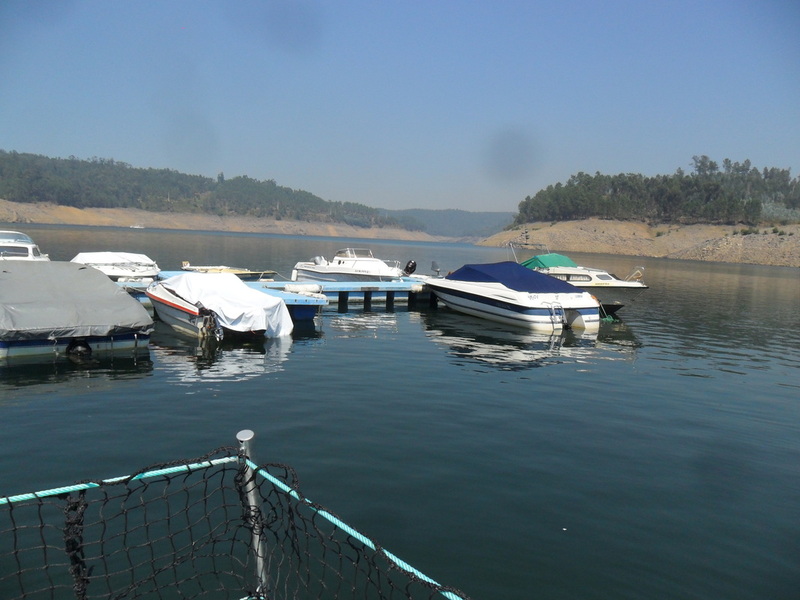 We should mention that a variety of boats can be hired from Clube Nautico at the Cabril Dam. 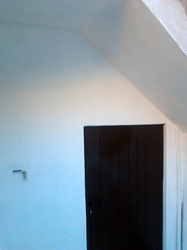 A discount is allowed for anyone who is renting our property. 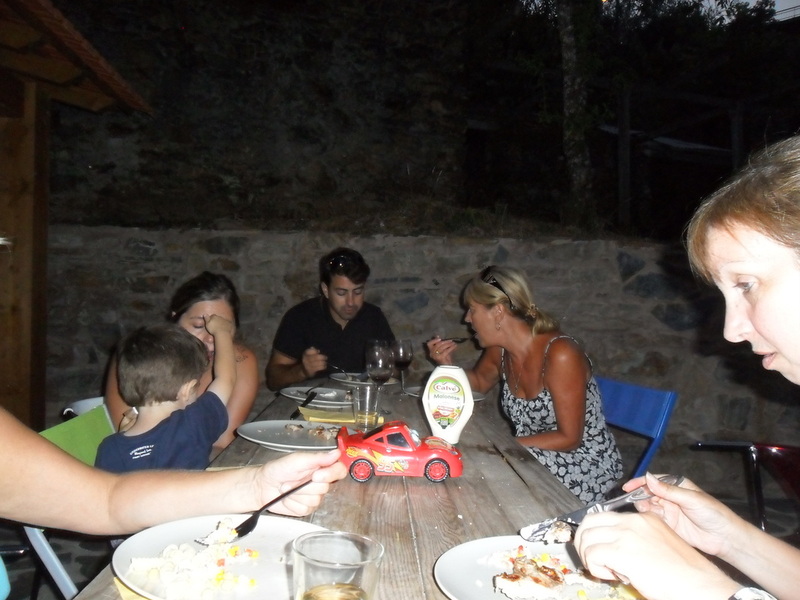 We are recently back from another visit to our beautiful house in Mega Fundeira. For the first time we were in a position to take a guest with us, my niece, who has just finished her A-levels and is waiting to start University. This was her first trip abroad apart from the obligatory school trips on a school bus so it was a whole new experience for her. Good fun was had by all! The weather was wonderful the whole time, opening the door of our air-conditioned car was like entering a furnace! 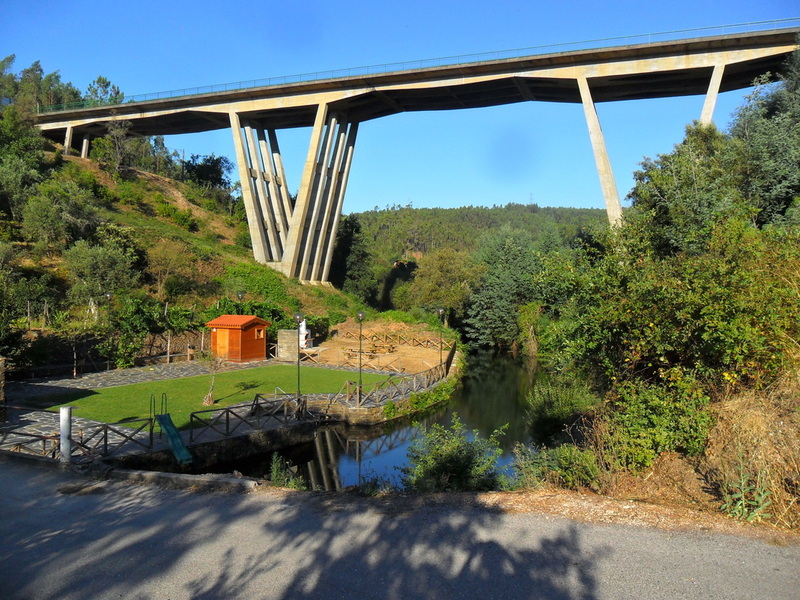 We managed to fiind a good balance between completing some outstanding tasks such as buying more furniture, visiting Parc Mondego;o a retail park just outside Coimbra and some minor works on the house with having a holiday and playing tourists some of the time. We visited Figueira Da Foz on the coast and, after eatiing a lovely pizza, we walked for miles around the bay (much to my nieces horror! ), ending the day with going to a less commercial beach and seeing local's buying freshly caught fish straight from the boat by the bagful. 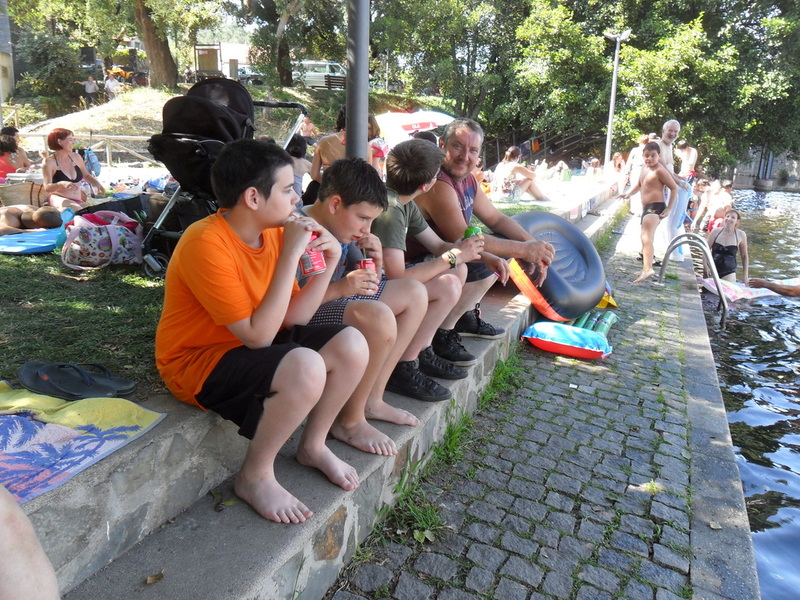 Another day we had a lovely relaxing time at Mosteiro river beach. 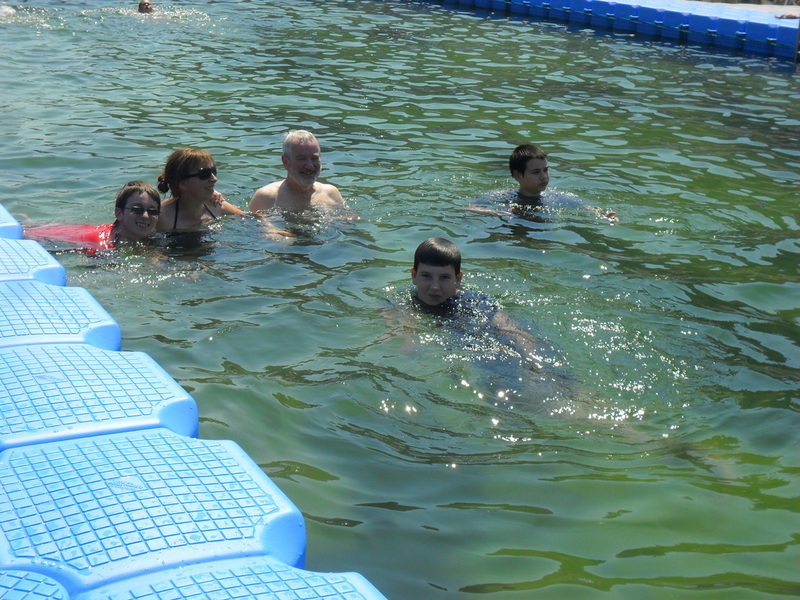 We also went to look at the Cabril Dam again and stopped at the Club Nautica pontoon where there's a swimming pool. Of course we also spent plenty of time on our very own river beach in Mega, enhanced by the fact that we bought some lilo's and tried one of them out in the water. We had good fun creating acrylic canvasses for the lounge and one of the bedroom walls. One of the paintings has been entitled by my niece, rather aptly "A glass of wine too many"! We have all three bedrooms furnished, after the Ikea debacle last time, thankfully we sourced a local second hand furniture shop in Avelar and even better the owner speaks really good english. We need only some garden furniture and a few smaller items of indoors furniture to be completed. One of the main headaches for us is to buy some shelving, or wood to make shelves for the understairs cupboard thus enabling us to create a pantry/larder - necessary as the kitchen is fairly small and lacking somewhat in cupboard space. We caught up with some, but not all of our friends -- Carlos and Fernando (and Claudia) of course, Tomane and Barry and Julie. It was really nice to find Snr Fernando and Fatima on holiday in Mega at the same time as us. We hope to see others very soon. We met up with Tiago, who Fernando introduced to us and who then subsequently came to the house with Tiago and translated on our behalf. 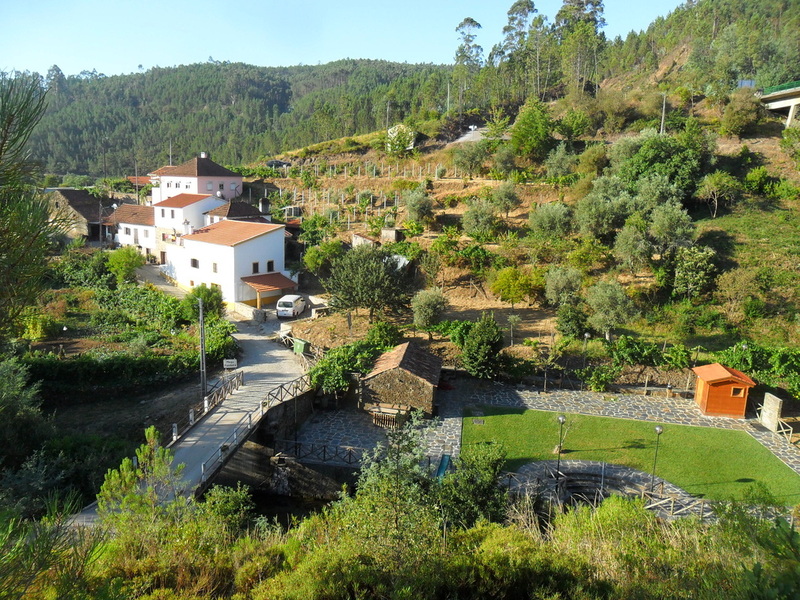 Tiago is going to maintain the land for us by strimming three times a year, pruning the fruit trees and such like. We were really impressed by the way he had cut all of our logs up for us from our fallen trees. Once again, Fernando's helpfulness and kindness has amazed us, nothing is too much trouble to help us. Fernando - you are great! 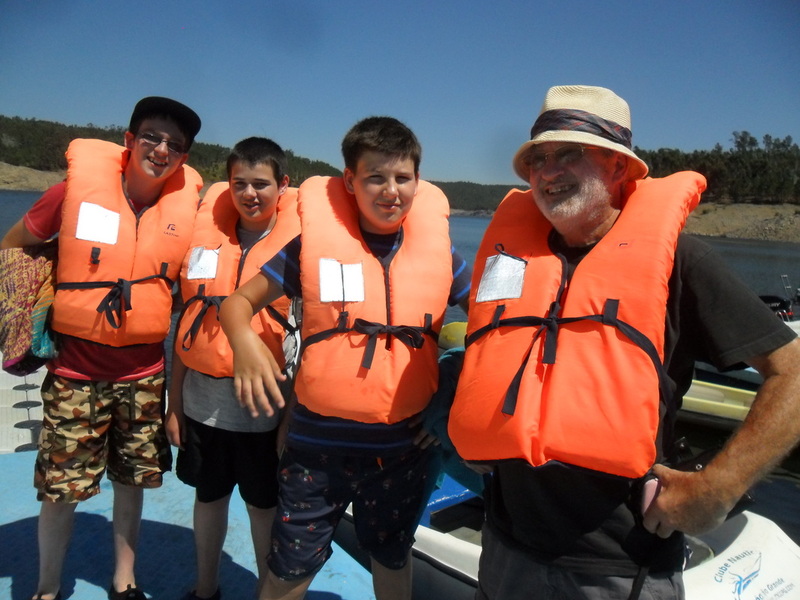 It was such a different experience to when we visited in March and it was cold and damp and very very wet, this time is was just glorious and a good time was had by all. There are plenty of photos available under the photo's tab and there will be another update soon as we are going back again very soon. All of the outstanding jobs on Paulo's list have now been completed - thanks Paulo. 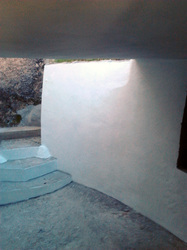 The courtyard he had rendered and painted as a gift. The furniture we ordered from IKEA in Porto failed to get delivered when we were there in March. IKEA refunded all of our money but their delivery company refused and asked to be paid again. It is strange that they couldn't find us or even locate Pedrogao Grande, as they had delivered to us twice last year. 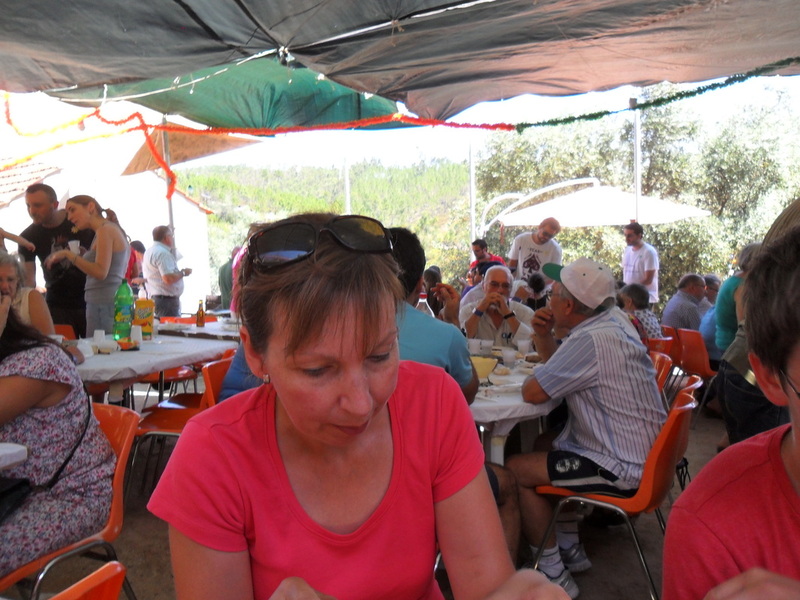 We have, however, found a couple of furniture businesses in Avelar that we will be buying from in July when we next return. 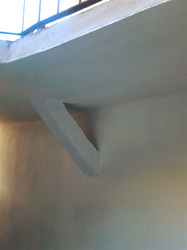 Another job that Paulo did was to build a step in front of the shower tray. We were finding that the water would run down the glass wall and out into the bathroom. We are hoping that this step will hold back the water. Some friends want to stay at the property this year. They will give us feedback and be a good test as to what still needs to be done prior to us letting others use it. 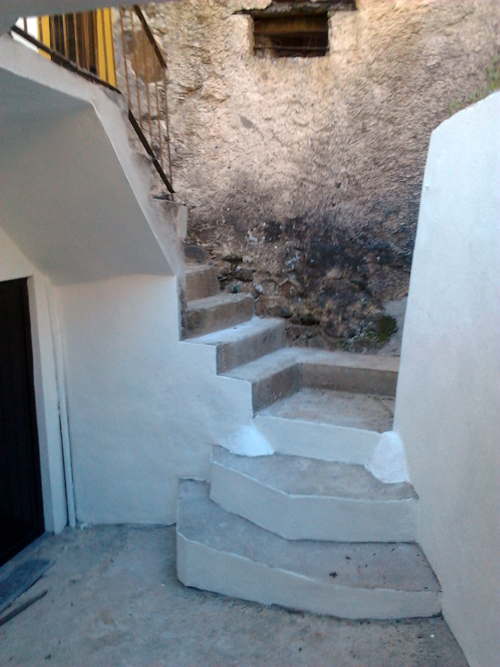 We would like to get the garden and terraces in some sort of shape. At present these areas tend to become overgrown and look a bit scruffy. The logs piled up beside the parking area are soon to be cut up and stacked under the terrace roof. Our good friend Fernando from Esfera has arranged for someone to do this job. The apple tree, seen on the left behind the logs, needs to be pruned. Any offers? Roy James and Susan Adcock.